I wish leaders of all religions and ideologies would view their religion and ideology like Ummon. Shunryu Suzuki in his book entitled Not Always So, which was published thirty years after his death, in 2002, has a very interesting description of Zen and going to the rest room. He writes that one of the Zen masters in history by the name of Ummon may have been the first to make a connection between Zen and rest room. "What is your practice? What is Buddha?" Someone asked Ummon. He answered "Toilet paper". Actually, nowadays it is toilet paper, but he said, "Something to wipe yourself with in the rest room." Suzuki says that is what Ummon had said and since then many Zen masters are thinking about it, practicing with the koan: What is toilet paper? What did he mean by that? I am not going to explain here what "koan" mean in Zen. My late friend Jack Li, whose teacher was Suzuki, in his article entitled Zen Meditation, has given enough explanation for it, and those interested can refer to his paper. I should mention that Jack was not religious and the reason he chose the Zen method for meditation, was because he thought one would need to choose a way of meditation, and follow it through, for meditation to give the intended results. I should say that if I were going to choose a religion, I would choose Zen, but I am not religious, although I see Zen meditation to be a useful practice. Also I need to note that I am against Sufism and mysticism and I have explained my view thoroughly in other writings, and my use of poetic expressions of mysticism here does *not* mean that I belong to Iranian mystic tradition. Let me return to the topic of our discussion here. 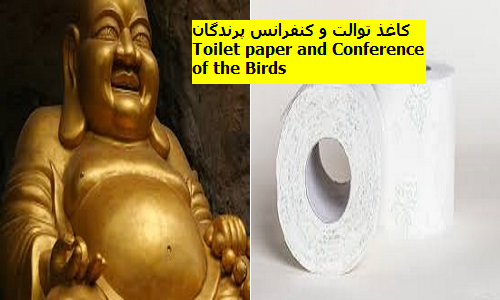 I think Iranian political movement can learn from the words of this Zen master who resembles his school of thought to "Something to wipe yourself with in the rest room". The various political and philosophical views in our movement, even the nonreligious ones, are adhered so doctrinaire, that their followers are not willing to talk of their ideologies and religions in this way, and are willing to kill for their doctrines, but are not willing to throw them out. They are not willing to go to the rest room and free themselves of the obsolete thoughts that weigh heavily on their mind. They consider such talk to be a great sin, whereas all they need is just a tool to clean themselves, so that later they can see the world with an open mind. Our problem is that all different political currents of Iran are drowned in history, and with a thousand tricks and deception, want to color their old school of thought and sell it again, as the Persian saying goes to color the sparrow and sell it as a canary. Instead of cleaning their mind of the waste, which is blocks their thinking and brings them back to the first step again and again, they keep repeating the same defeated verses of their holy books. What is wrong with the Iranian Opposition? This was the title of an article of mine in 2002. Some international circles concluded from the described situation of discord that Iranian political movement will have a hard time to resist the attacks of Islamic Republic of Iran (IRI) 's security forces. The reason for having so many groups is not because of the differences of their political programs, or because of freedom of thought and democracy. It is because as free individuals we have not been successful to cooperate with each other. If a group has remained together, it has been because it has worked like a cult, and not as an association of free individuals. All our political lines have hundreds of groups and parties where their quarrels are like the fights of Shiite and Sunnis, like hundreds of dead and living dead schools of thought. In 1994 I wrote in an article entitled Conference of the Birds, where the title was the English translation of Attar's Mantiq al-Tayr's book. Attar according to the one in charge of his tomb, whom I had met in Nishapur of Iran, was beheaded by the Moghol invaders, and according to the legend his head was still talking of the atrocities of Moghols, and the same Moghols, fearing people's revenge, made a tomb for him. In fact, the same discord that defeated Iranians in face of the Moghols, today has been with us all these years of IRI, and the murderers of Dariush and Parvaneh Forouhar just like killers of Attar, are hearing his voice, and make tombs for them, fearing the revenge of the people, but our birds of freedom themselves, are tearing each other apart. Why can't we discard the obsolete politics and philosophies from our minds? The best thinking is the one that has no fear to be discarded in the rest room. Because it is not scared of people viewing the world with an open mind. Our story is the story of the birds of Attar who need to look at themselves in the mirror of Ghaaf Mountain, and see that the legendary Simorgh is none but the thirty (si in Persian) birds (morgh in Persian) of them, who are together, looking for the future of Iran, and inability to discard the waste of the past, weighing on our minds, is not allowing us to see this simple truth, and for all these decades, we are still busy repeating the same thoughts, that were defeated in 1979, and this way because of this waste, we are still alienated from each other.